Experience Portland’s vibrant beer culture and taste award-winning, local beer on this 3 hour walking tour. Guests will taste their way though Portland’s world famous beer scene and sample a wide variety of different beer styles. Everything from local IPAs and Northwest pale ales to Irish Reds and creamy stouts. We sample at least 11 different beers from 3 local breweries. Walking Distance is 0.7 miles. 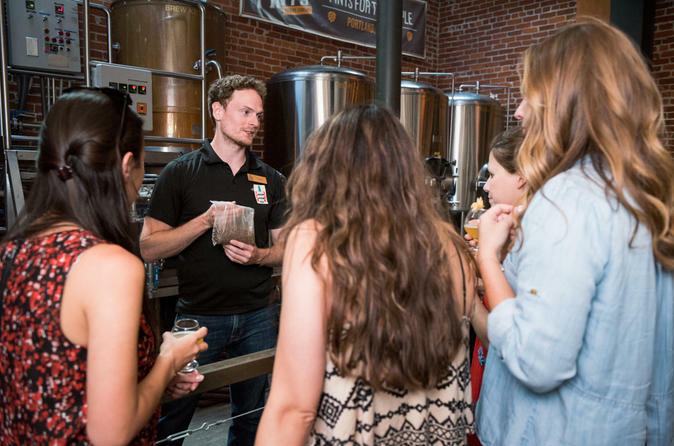 You’ll go behind-the-scenes in a fully functioning brewery to see how beer is made and sample some of the ingredients used in the brewing process. Between beer stops, you’ll stroll through the Historic Old Town District and learn about local landmarks including Erickson Saloon, Skidmore Fountain, and Portland’s oldest bar. By the end, you’ll be a savvy beer-drinking pro with a head full of knowledge and a belly full of delicious local beer.